Japanese carmaker, Nissan which will mark its debut as the first Japanese OEM to enter the Formula E championship, has strengthened its partnership with e.dams. The company says by purchasing a stake in the championship-winning racing organisation (e.dams), will help it showcase the ‘performance side’ of Nissan ahead of its debut in the ABB FIA Formula E electric street-racing championship. The company says it will join Formula E as the first Japanese carmaker to participate in the innovative series and as a leader in electric cars to showcase its vision for changing how cars are powered, driven and integrated into society. Based in Le Mans, France, and co-founded by team principal Jean-Paul Driot, the e.dams organisation emerged from DAMS, a leading contender in European open-wheel and sports car competition for more than 30 years. In its previous partnership with Nissan's alliance partner Renault, e.dams won the Team Championship in the first three seasons of Formula E. It also holds records for most wins and pole positions. "For Nissan's first Formula E experience, it makes sense to partner with e.dams and be able to draw on the organisation's experience of winning races and championships," said Roel de Vries, Nissan corporate vice president and global head of marketing and brand strategy. "The level of competition in Formula E will get even more intense for season five, with a series-mandated all-new car and powertrain. As part of our commitment to our partnership, Nissan has now purchased an ownership stake in the organisation, and we're excited to work with Jean-Paul and his team." 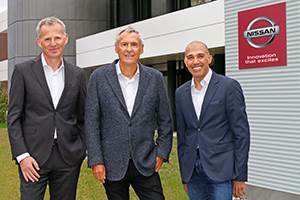 L-R: Roel de Vries, Nissan corporate vice president and global head of marketing and brand strategy; Jean-Paul Driot, e.dams founder and team principal; and Michael Carcamo, Nissan Global Motorsport Director. Paul Driot, said:"With our new partner Nissan, we're eagerly awaiting the new challenges ahead. We're very proud of our history in Formula E, and we're looking forward to adding new pages to the series' history books with our new partner and the new car." The partners have begun testing the all-new ‘Gen2’ Formula E car, which they say provides more power and range and eliminates the need for the midrace car swap that was a feature of Formula E during the first four seasons.